BSM FOOTBALL MEDIA GUIDE 2014: "EXPECT GREATNESS"
Adam Sellke hasn't added a story. Hey, Alums! Show your support for Red Knight Football! Add your name to the list of alumni players who support the 2014 campaign in an ad to be placed in the BSM Football Media Guide. This 60+ page full-color guide is the biggest fundraiser the program has. Our goal is to raise $600 for a half-page page ad. This year's team theme is "Expect Greatness". So bleed red (and a little green) and show your greatness by making a contribution today! Adam Sellke hasn't posted any updates yet. 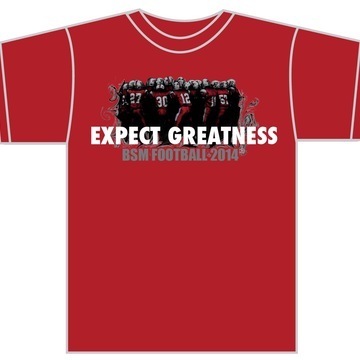 Contributions of $50 or more will receive a commemorative 2014 "Expect Greatness" T-Shirt. Adam Sellke is managing the funds for this campaign. The campaign is for a personal cause.